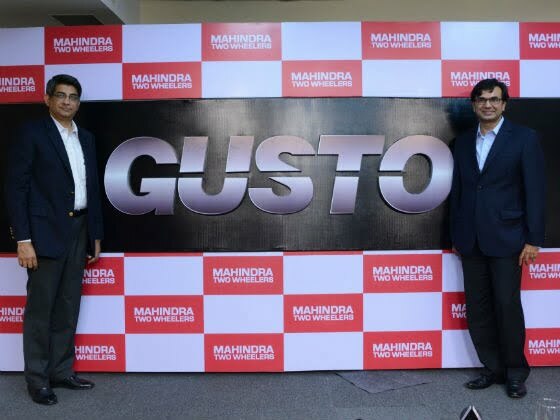 Mahindra Two Wheelers Ltd is all set to launch its global scooter ‘Gusto’ on September 29, 2014. Gusto is a 110 cc scooter from Mahindra which will be launched in India and Nepal on September 29, followed by Central America, Africa and South Asia in the coming months. Mahindra Two Wheelers affirms to offer unique features in their Gusto to stand against its rivals like Honda Activa, Hero Maestro, Suzuki Let’s, TVS Scooty Zest, Yamaha Ray and Yamaha alpha. G101 i.e GUSTO, the name is derived from the word ‘Gust’ which symbolises the spirit of freedom. Gusto is going to be the first global scooter from an Indian auto manufactures Mahindra. Mahindra Gusto churns out 8 BHP of peak power and 8.5 Nm of maximum torque with its single cylinder 4 stroke, air cooled engine. Tubeless tyres of Gusto will be mounted on the 12 inch wheels and the front suspension of the scooter uses telescopic forks. Mahindra Gusto has been fully designed in Italy. It has a 110 cc engine and have a remote start key which is first in its segment. The Gusto is expected to be priced between Rs. 40,000 to Rs. 45,000 (Ex-showroom). You can check out the spy photos and other details about the Gusto here. What do you think about the Mahindra Gusto Scooter for the Indian market, let us know in the comments section below.